The other night Sam and I had Randi and Marty over for dinner. Sam requested this dish- which I love and long looked for a recipe but did not know its proper name. I made a huge heaping bowl of it and we ate almost all of it before I remembered to take a picture- so my apologies- it was way more gorgeous than this image suggests. There are tons of recipes for this- but for Italian cooking- I trust Marcella Hazan. I love her recipes because they are so simple– and she has my favorite risotto recipe. Marcella fries her eggplant and while I am sure that would be super delicious, I decided to be healthier and bake the eggplant- I put both ways in here so you can choose. We were having an early dinner- so I salted (this draws out moisture and bitterness- otherwise eggplant will soak up oil like a sponge and take forever to cook– a lesson I learned the first time I tried to cook eggplant parm w. Juan Carlos in my philly apt) and baked off the eggplant the night before. I used ricotta salata- a classic cheese for this dish- it is ricotta that comes in a block sort of resembling feta. Fresh ricotta or mozzarella (ooh or even smoked mozzarella maybe?) would work well too. And by the by, Marcella calls this dish Eggplant and Ricotta, Sicilian-Style. 2 cups fresh ripe plum tomatoes, skinned, peeled and seeded cut into narrow strips or when tomatoes not in season use a 25oz can of whole plum tomatoes- drain then chop. Cut off eggplant stem. Peel (optional) eggplant and cut into 1-1/2 in cubes. Put cubes in colander, set over big bowl, sprinkle liberally w. salt. Let eggplant sit for about an hour so salt draws out bitter juices (you’ll be able to see brown liquid in bowl). (Yes, this is a necessary step). Take a handful of eggplant, rinse under cold water to get off excess salt. Wrap them in a dry paper towel and squeeze to get out as much moisture as possible. Spread on another dry towel and continue until you have rinsed all eggplant cubes. If frying: Put enough veg oil in a large frying pan to come up 1/2 inch side of the pan- turn to med high. When oil is hot, slip in as many eggplant that fit loosely in the pan- might have to do batches. When eggplant feels tender when prodded with a fork, transfer it with a slotted spoon or spatula to a cooling rack or to a platter lined with paper towels to drain. Pour off the oil and wipe the pan clean with paper towels. If baking: Preheat to 350. Line a baking sheet with foil. Brush w. olive oil. Spread out eggplant in single layer. Bake until it looks done– I’d say between 20-40 mins- it starts to looks shrunken, browning and tender. Put olive oil and onion in pot and turn to med high. Saute until onion becomes light gold colored. Add chopped garlic- and cook for a few seconds, stirring as you cook. Add the strips of tomato, turn up the heat to high, and cook for 8 to 10 minutes, stirring frequently, until the oil floats free from the tomato. Add the eggplant and a few grindings of pepper, stir, and turn the heat down to medium. Cook for just a minute or two more, stirring once or twice. Taste and correct for salt. 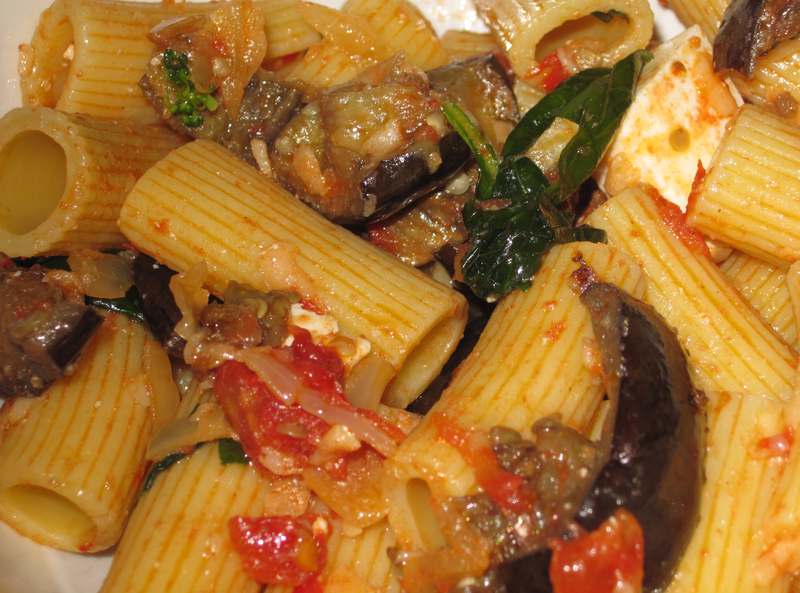 Toss the cooked and drained pasta with the eggplant sauce, add the grated romano, the ricotta, and the basil leaves– mixing thoroughly– and serve at once, with the grated Parmesan on the side. WOW! I get hungry just from looking at the photo– can’t wait to try your recipe!